Canadian News : 16 Player 500$ Entry Semi-Pro This Weekend. 16 Player 500$ Entry Semi-Pro This Weekend. This weekend the guys at Pool Stream TV are at it again. 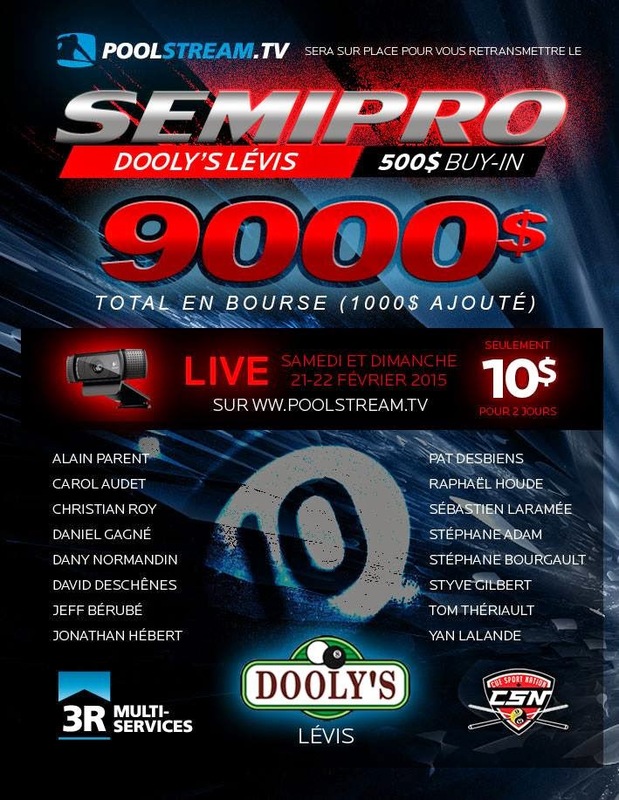 This time for the bargain price of 10$ they will be streaming the action live from Dooly's Lévis. The format this weekend will be double elimination $500 entry and I believe it to be races to 11 on both sides. All the top Québec semi-pro players will be in attendance such as Alain Parent, Stéphane Adam, Jonathan Hébert, and many more. Top AAA players such as David Deschenes and Pat Desbiens will also be in attendance. This will be a two day event which will take place this weekend Feb 21-22 don't forget to go to Pool Stream TV website to order the weekend pass so you don't miss out on the action this weekend. Thank you to Daniel Robichaud and Fred Lapointe for all the information and for the cross promotion opportunity. Chang & Ramos Come Out on Top!